This has been happening for a while now when selecting locked Instances (the best example being CSGDictionaryService), but as of this recent update it’s more easy to cause because GuiRoot is easily visible. This happens every time anything that’s locked to these plugins are selected. The expected behavior is that they don’t error. Ideally this would be changed rather than patched in these particular plugins, as other plugins I have installed error on selection too and it’s a tad annoying, but if this were changed in the built-in plugins it would eliminate the main problem. 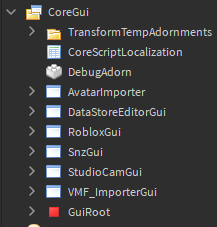 It appears that the legacy GuiRoot service has recently been updated so that its parent is inside of the CoreGui. 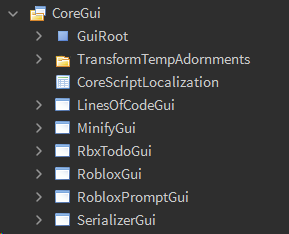 There are some plugins on Roblox that iterate over the contents of the CoreGui. Because there is a class security check in place for GuiRoot, any plugin that attempts to iterate over the CoreGui’s children can run into an error if it doesn’t check for this object carefully. This change should be undone, or the GuiRoot’s security should be loosened slightly so that it doesn’t cause problems like this. This is fixed now. The GuiRoot class has been removed as of 3/7/19.